Cleaning of aircrafts, vehicles, glass facades and window frames by osmotic water. Sale of products by Permanon. 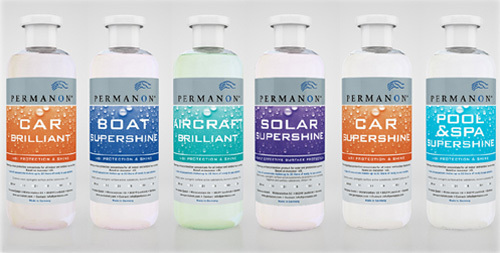 Permanon is the leader of high-tech protection and surface cleaning, the manufacturer of advanced, environmentally friendly cleaners and preservatives, based on Si14 silicon nanotechnology. Nanotechnology makes the cleaned surface gain a new glow, that lasts a lot longer! Products by Permanon are efficient, easy to use, and due to nearly 100% biodegrability, also enviromentally friendly.Through the content of Si14 silicon nanoparticles, there are no chemical reactions with the treated surfaces. Competitive products usually consist of silicone oils, disilicane fluorides, mixed with solvents and alcohol, and thanks to that they become toxic and flammable. Products offered by our company can be used on all types of surfaces. Permanon’s product range includes specifically agents for cleaning and maintenance of aircrafts, automobiles, buildings, boats, swimming pools, catering facilities, SPA and high-precision technologies in sport. Our products are constantly tested for their strength and neutrality for the secured area. If you are interested in the purchase of manufactures by Permanon, please visit our online store.